The school year is full. Sometimes it makes my brain hurt to think of just how much goes on during these months out of the year. Often at times our days are a blur, going from one portion of our day to the next. Between time in the classroom, after school activities, and endless amounts of homework - sometimes it's tough to just let kids be kids. This last month has been particularly busy. With Halloween, teacher's conferences, Fall tournaments, and Thanksgiving programs on the horizon, I realized our schedule was overly full. I stepped back and decided to really make a conscience effort to have moments in our day that are just play time. Playtime is so important not only for their little bodies, but also for enhanced learning and overall health. I quickly realized that making some tiny adjustments in our day to allow the kids more playtime was one of the best decisions I have made. Our favorite moments of each day always seem to be when the giggles are high and the routine is forgotten - if even for a brief moment. After seeing what positive results we've gained from sneaking in more playtime in our day, I know I will be using these tips and tricks for the rest of the school year. My kids have a ton of energy. They thrive on active activities and love to be outdoors. Even if for ten minutes here or five minutes there, their moods seems so much happier when they get some fresh air. If we are at home a quick scooter/bike ride, throwing rocks into the lake, or even a fast paced game of tag does them some good. I usually try to sneak these little moments in just before or right after we have to go somewhere. I adjust my time accordingly and get us "ready" and then make sure we have a few minutes to play before we get in our car for our planned adventure. I was nervous when I first started doing this that it might cause more harm then good. I was worried the kids would be having so much fun they wouldn't want to stop, but for the most part they've been happy and satisfied to have these fun quick bursts of playtime. As a parent you realize kids need a ton of fuel to run around all day. We hear approximately 4,679,503 times a day, "I'm starving, can I have a snack?" Those little bodies burn a ton of energy, and I've learned that by making sure they get proper nutritious meals and healthy filling snacks throughout their day you are ensuring that they getting the fuel they need to operate at their best level all day long. When the kids feel their best, they can play their best. Whether it's in their lunchbox for school, an after school snack while doing homework, or grabbing a quick refuel on the sidelines during practice, I've learned that having healthy snack options ready to go on a moments notice allows for kids to be able to play when they are ready. One of my kids go-to favorites are the CLIF Kid Zbars (And if I am being totally honest, one of my favorites too - Hello fudge brownie!). The CLIF Kid ZBars are our favorite because not only are they easy to have with you when on the go, but they are perfectly proportioned for kids bodies and filled with yummy tasting organic ingredients and nutrients that kids need in order to stay active. Did we mention they also taste ah-mazing? I love that CLIF Kid® makes such a yummy tasting snack that the whole family loves. This should come as no surprise though. CLIF KID is such a wonderful brand that continuously promotes kids and the importance of including play into their day. If you get a free moment you will have to check out this amazing video they created on just how important play is to them. To us the CLIF Kid Zbars are a no brainer. With the daily chaos it is nice to know that I can go without a worry that I am giving my kids a healthy choice, and I can concentrate on the bigger picture - playing with my kids. Most afternoon and weekends are filled with all of our extra curricular activities. It's a lot of shuffling around. Often at times while one kid is participating in their activity, the others are waiting patiently for their scheduled time slot, or simply on the sidelines cheering. Translation: There is a lot of downtime for the kids not playing in the activity. 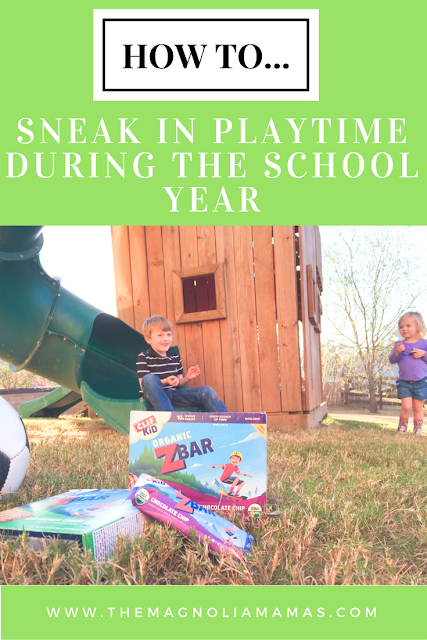 Rather than just sit on the sidelines, I found this was one of the many ways that you can sneak in playtime. Find an open area or play place close by, and once you have downtime let the kids get in some unrestricted free play. Discovering new areas of play is sometimes better than going to Disneyland for my kids. They love to be able to discover new things each place has to offer - see what slides are the fastest, which one has the best hidden tunnels, and their favorite, which one has the best equipment to climb and jump from. When there isn't a play area close by, I've learned most places have an open space or at least some sidewalk. I've learned to pack my trunk with a few extra balls, sidewalk chalk, or even a scooter or two so that we can be sure to grab that extra playtime. One of my favorite ways to sneak in play in our day is turning learning activities or homework into fun games. After speaking with Cute's teacher about some engaging homework alternatives, and recognizing that Cute learns best with activities that are play based, she gave me some suggestions for incorporating learning into outdoor play. One of my favorite games has been Sight Word Hopscotch. We create a quick hopscotch board and use some of his vocabulary words for the week or the sight words that need review in lieu of where you would place numbers. This game has been a huge hit and he's surprisingly picked up several new words after just a few moments of play. I love that he is able to move his active little body, enjoy playtime and learn all at the same time. It's an all around win! What are some ways that you sneak playtime into your kids' day? I LOVE the Clif kid bars... sometimes I sneak one myself haha they are delicious and nutritious! YES!! They are so yummy! I keep sneaking them myself. Don't get me wrong, I love the adult CLIF bars, but the CLIFKids Zbars are just the right size. The brownie and the oatmeal are my favorite! I like the chalk idea! I am sometimes resentful of how school overwhelms our life. It's not just the regular hours, but the events, sports and homework. It's really important to be intentional to find times to play. Oh, and I totally agree about outside time! they can't get enough of that!